In her first televised interview since leaving the White House last January, former first lady Michelle Obama was greeted with a prolonged standing ovation while joining Ellen DeGeneres as the host gushed to her audience, "Don't you miss her?" 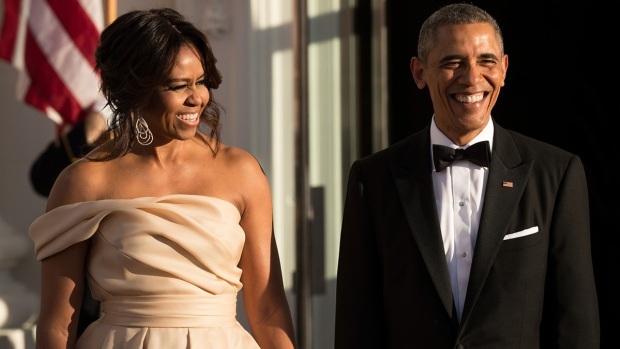 Obama joined DeGeneres on Thursday's broadcast as the host kicked off her 60th birthday celebration. Obama came bearing gifts, including wine and a Barack Obama chia pet. The former first lady discussed life after the White House, joking she was "just hanging out." "I wake up when I want to wake up. I, you know, I got myself all gussied up to come here. Came out of the basement. It’s just like what? Come out of the house?" she joked. " But we’re doing great. The girls are good, Barack is working, we’ve got projects going, so we’re staying busy and traveling. We’ve had some fun." But the conversation quickly took a more serious turn as DeGeneres shared her fears over the current state of U.S. affairs. "I personally feel the world is a very scary place right now and I do a show where I'm supposed to make people happy and forget about what's going on in the world," DeGeneres said. "What's your take on what's happening?" "People are afraid," Obama said. "But then there are people who feel good about the direction of the country, so I mean, that’s what makes this country complicated because it’s made up of so many different people from different backgrounds. I mean, we are this mosh pit of society and sometimes there’s a rub." Obama added, "The thing I learned in the eight years I was in the White House was that what we do every day in our lives, the good things that we do every day and we know we do it. We show empathy, we care for each other. You know, we do have a lot in common. That’s what it means to lead with hope and not fear. And that’s all we have is hope."